@montypower loved following your build! You'll love the King Coilovers and resi-shocks! It's amazing why more people don't buy them. Mitsu buyers are typically so broke and cheap! My thought is buy a cheap rig so you can put the good parts on it. They are original upper control arms. Just clearanced and additional reinforcement added. Not difficult for any decent fabricator. The reservoirs were mounted with band clamps. I don't recall how I secured them to the body. Rear bumper added massive clearance! Removal of trailer hitch, remove exhaust resonator and removed rear ac/heater setup. Also the body was trimmed up and welded up. The rear heater removal took a bit of work. The G3 monty was sold with and without the rear heater. So I found the proper oem hoses and bypassed the rear coolant feeds at the motor. So it was all OEM. The AC refrigerate feed was slightly more involved. I bypassed the rear splitter feed by having a local ac shop weld up the t fitting the fed the rear lines. Good news... it simplified the coolant/ac system and removed the low hanging rear heater/ac unit and eliminated the possibility of losing coolant from a line getting snagged or failing. Thanks for your replies! Just ordered Kings today and looking forward to hitting the trails with them! 99-06 Mitsubishi Montero / Pajero V60 King Shocks Kit - Starting at $1,520 w/ Free Shipping! 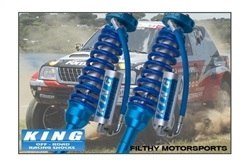 King Performance OEM Upgrade Shocks are direct bolt-on replacements for Mitsubishi Montero and Pajero vehicles. They come with all the necessary hardware for easy installation and are tuned by King Racing for the best on and off-road performance. They work very well. Huge upgrade from the OME Old Man Emu which was a huge upgrade from stock. Excellent. Share more about your experience. Maybe some of the other Mitsu guys will follow. You do get what you pay for. Next project... Well, I have a fleet of fun rigs. 2010 Winnebago View (setup for remote off grid: solar, lifted, tires, on board air, etc) - spent 86 nights in it last year. 1998 Rav4 2 Door Convertible - Manual (fun rig - restored it and lifted/tires/etc). 1998 Tacoma (rock crawler : setup for week type camping trips sleeping platform - 37s, arb, dual cases, supercharged). 2010 HHR SS - Manual 260HP (road trip vehicle and hauls mtn bikes and just fun). 2016 Jag F Type S (new member - named Jagster and 6 speed manual - fun twisty road vehicle). I couldn't swing the $3k for the Kings so I went with Lovells EHD Front / HD Rear + Bilsteins for my Gen3 build but I will be saving up for these Coilovers for later on down the road. I was tempted by Dobinsons because they came out with a coilover that's less than half the cost of Kings but too many bad reviews of the shocks failing. They got the ride and comfort right, but couldn't get the reliability right which is why I went with the known, most proven option. Be sure to keep us posted ChrisCosta416 on all aspects of the Kings! How install goes, and how the ride is, etc. That is awesome, have any photos? Will do! Ill report back in 4 weeks! Here's the fleet! Montero was the "do everything" vehicle (big sunroof: open air like convertible, spacious: sleep/camp inside, rock crawler: conquered the Rubicon, big v6: sporty-ish, practical: decent fuel mileage). But decided that having different vehicles for every task would be more fun. This has been an accumulation and building for the past 3 years or so since selling the montero. All the vehicles are rather completely gone through. I am digging the Jag. Quick question, by any chance do you have the Motion rate of your Gen3 Montero? I need some measurements for my King shocks and was wondering if you already took em and have them stored somewhere. If you do not have them I can just measure my own but I am hoping someone has these measurements handy! That's way too complicated... Just bolt in the coilover. Mark the contact area on the upper control arm (easy and very obvious). Only makes contact at full extension. Remove upper a-arm and trim/weld additional plate/support. Bolt in. Really really simple. Not a big deal. FYI - OME struts also contact the upper control arm at full extension. Probably has more to due with heavier rate coils (larger diameter). Alternatively, you could install limit straps but you'd lose some wheel travel (less ideal). Thanks! I plan to trim the control arms. As far as the tuning accutune is offering it for free with purchase so I still “might” try to tune em. I’m excited to ride on Kings soon!